Barcelona Photoblog: Human or Living Statue: Goblins in Las Ramblas, Barcelona? 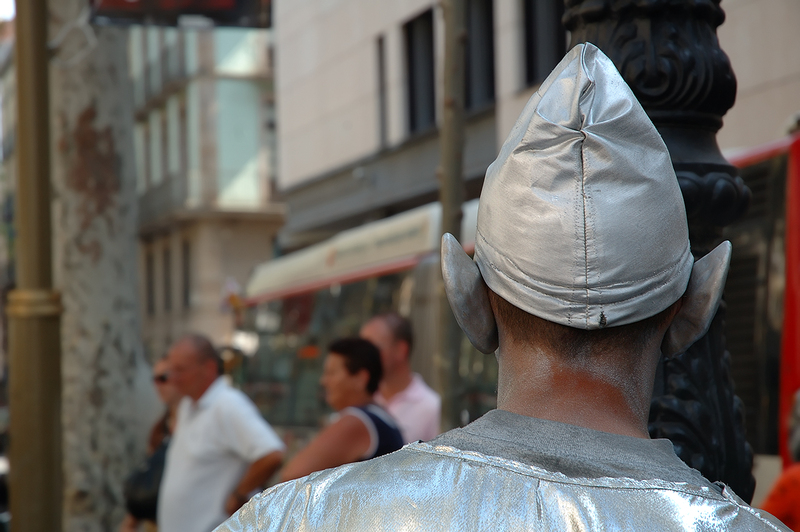 Human or Living Statue: Goblins in Las Ramblas, Barcelona? - A set about inhabitants of Papua, New Guinea by Eric Lafforgue. - I have started a new blog that compiles blog posts, news, some videos and good widgets all related with Google Hot Trends list. Any of the tags referred to as volcanic or on fire are a gold mine if you manage to include them in your post and still make some sense. Please try Hot Google Trends and tell me what you think. Love the photo of the street artist, front and back. I also liked the Papua, New Guinea ones and your Street Artists. The Hot Google Trends wouldn't open. Thanks for visiting Portland (OR) Daily Photo. Todos os dias passo aqui para ver barcelona e nunca vou desapontado. I saw your previous picture of the Elf (?) when you first published. A few days later, I saw this guy live in Las Ramblas and I remember your picture immediately. I felt strange. You really give the pulse of the city through your pics and for another time I'd like to thank you! By the way, did you visit the Lee Miller exchebition in Picasso Museum? It was really amazing. I don't know if it's still on. That's great Daniel. It means that time was well spent, I love that you don't get disappointed. Me alegra que no te vayas "desapontado" ningún día. Obrigado Maria Luisa. I have added your site to my list of DP. Sorry about not doing it before. Tiverius, your comments are kind. About Lee Miller. I am awared of the fact that there was an exhibition, but no, I didn't visit it. I am a busy man and my only time left is devoted to this blog and the pictures. I really wish I could visit exhibitions often. Thanks. It is great that you visited my city and have such good memories. Carlos, I have never seen a living statue in real life. Thank you for sharing this!